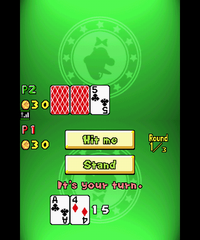 Luigi-Jack is a multiplayer Table minigame in New Super Mario Bros. that is named after and played like the actual card game, BlackJack. The way to win the coins is to have a bigger number than the other player without going over 21. Each player starts with thirty coins and they can earn more by getting a better hand. If a player gets 21 exactly in three, four or five cards, then the player gains double coins from the other players but if a Luigi-Jack is drawn, then the player gets triple coins. If the player goes over 21, then that player loses five coins. They all have to pay the winner based on what he beats them by. Whoever has the most coins at the end of three, five, or seven rounds is declared the winner of the game. The game is also over if someone runs out of coins. This page was last edited on December 3, 2018, at 02:30.